Cross-Compatible: Support IOS, Android and Windows system. 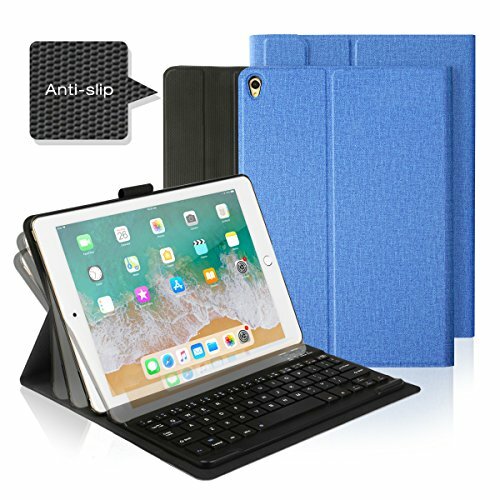 This wireless keyboard work for most of tablets and smart phones like iPhone, iPad 2017, iPad Pro, iPad 2/3/4, iPad Air, Samsung Galaxy Tab A,GALAXY Note, LG, Nexus, Huawei, ZTE etc. With Adjustable Stand: A free considerate adjustable holder stand as gift come with the keyboard. You could carry the keyboard anywhere you go for trip, travel, meeting and stand your tablet/phone anytime anywhere. Super Compatibility: Perfect metal back design. You also could assembly with your same size keyboard case easily via the magnetic. Long Battery Life: Built-in rechargeable lithium battery provides for 140 hours of uninterrupted usage, while auto-sleep feature saves power and ensures you get the most out of every charge. Perfect Size with Lightweight: 9.3"L x 5.2"W x 0.2"H (235mm*135mm*5mm). Small enough to put it into your suitcase/handbag. If you have any questions about this product by AntArt, contact us by completing and submitting the form below. If you are looking for a specif part number, please include it with your message.